especially if you do not live in the U.S. Today I have some questions that I hope your readers can help with. 1)what happened to wolf R29m? I know he’s deceased but how did he meet his end? The last information I can find on him states that he became the alpha male of the Gros Venture pack. 2) Who was and currently is the biggest wolf in Yellowstone and how big were/are they? 3) As the reports state that they Yellowstone wolves are getting bigger , what is the possibility of an extreme sized wolf similar to the 70 mile river wolf of 175lbs or the Poltavski wolf of 189lbs? 4) The wolf report of 1997 has a 52.3kg pup recorded in it, anyone know who this pup is and what happened to him? 1. The famous escape artists wolf R29M was displaced or left the the Gros Ventre Pack, but was (maybe) last seen in the general area in 2002. On my old web site I have tables showing what happened to all to the reintroduced wolves. It also gives their weight at capture in Canada. The links are below. Fate of the 1995 Yellowstone wolves (table). Final revision Jan. 9, 2003. All the 1995 wolves are now dead. Fate of the 1996 Yellowstone wolves (table). Final revision March 4, 2004. All of the 1996 wolves are now dead. Fate of the 1996 Idaho wolves (table). Last Revised Dec. 2005. 2. I’m not sure which is the biggest wolf in Yellowstone Park right now because I haven’t acquired their 2009 capture data, but the biggest one caught in the past was R6M, who weighed 141 pounds. He was killed by an elk in 1998. 3. Yellowstone wolves are not getting bigger. They seem to be getting smaller, probably because they not as well fed as the early wolves. The possibility of the 175 or 189 pound wolf is very low, although not impossible. After all, there are humans that are 8 feet tall. Extremely large individuals are usually not very healthy. Their large size alone means they will probably soon become afflicted with arthritis. 4. I can’t find my 1997 wolf capture report. I can’t answer the question unless you have the pup’s collar number. Update From Ken Cole 4/11/09: Here is a graph showing the weights of all wolves from Yellowstone that I have information for as well as the original Idaho re-introduced wolves. 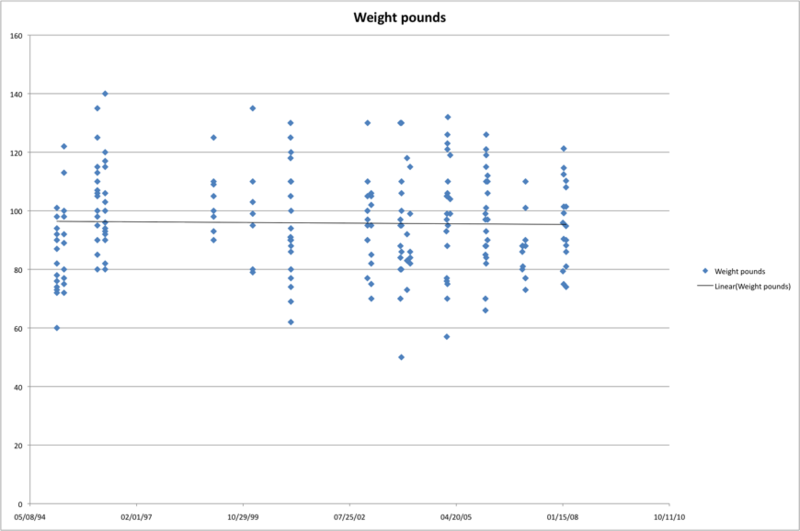 I’ve added a trendline to the graph which shows a slight decrease in weight over time. However, when only wolves described as adults are included there appears to be a slight increase in weight as shown in the lower graph.One of the primary differences between the two trends could be the time of year when the wolves were captured. The date of capture varies from November to April so, with regard to sub-adult weights and differences in hunting success over the course of a year, these values are probably not statistically significant. Keep in mind that the weight of a wolf can also depend on how recently the wolf has eaten. One of the largest wolves weighed had just eaten from a fresh kill so could have had 20 lbs of meat in his stomach. Also, some of the more objective measurements such as skeletal measurements as compared to weights are not available to me. I don’t even know if those measurements are taken but I assume that they are. These measurements would be a greater indication of condition factors of the wolves. A good analogy could be found in fish. I’ve caught 23 inch trout that weighed 6 lbs and I’ve caught 23 inch trout that weighed 4 lbs. These things change due to diet and time of year. The information for Idaho wolves has not been made public to my knowledge. If anyone has this information it would be useful. Graph showing wolf weights from Yellowstone and the original reintroduced Idaho Wolves. Adult Wolf Weights of Yellowstone and original Idaho wolves. How interesting: Hale and hearty elk sometimes kill wolves. And And I bet no one suggested wiping out the elk herd as retribution. I also might add that generally wolves stop growing at about age 2. Any increase in size has to do with muscle and fat weight not skeletal growth after this point in a wolf’s life. The analogy about fish, in one sense, is not the greatest because fish continue to grow throughout their lives and wolves, like all mammals stop growing once they reach a certain age. The largest wolf ever weighed in yellowstone according to Doug Smith was 147 pounds (His report from the Idaho Wildlife Society Meetings). Barstool conversations could really benefit from facts like this and get logical thinkers to question some of these comments. I am surprised there was not a piece on your website about the wolf sighting in Blackfoot and the claim by one of the ranchers (surprisingly enough) that they posed no risk. And were actually eating after birth and calves that didn’t survive (another one of those facts that dispels only warm blooded meals). Your second graph that shows orginal Idaho wolfs – where does that data come from? Original Idaho wolves, there are data for wolf weights prior to reintroduction? I thought the info on the wolf sighting (there was more than one wolf) was very interesting, and the rancher’s comments too. I couldn’t find an Idaho State Journal (the Pocatello newspaper) link to the story. Yes, it was on the front page. And were actually eating after birth and calves that didn’t survive (another one of those facts that dispels only warm blooded meals). Coyotes do this as well so maybe they are not quite the scourge that people make them out to be. When the wolves do this in central Idaho, Wildlife Services always jumps to the conclusion that the wolves were responsible for the dead calves. the afterbirth, a real delicacy I understand for wolves, is never mentioned. Of course, WS is always on a hair trigger. I know this isn’t news to any of you in terms of wolf behavior but to many it would be. You can’t expect ppl to know the facts but you hope that everyone who doesn’t pick up a scientific journal or any reading material for that matter won’t succumb to every single one of Ron Gillett’s talking points. It was also refreshing to hear a rancher that hasn’t been indoctrinated. Ken, give me a heads up on the above question in case you missed it. I can answer it. I copied the weights off of the actual data sheets the filled out in Canada when they caught the wolves. Suzanne Stone had them (they might have been photocopies, I can’t remember) in her possession, and back about 1998 I copied the data by hand. I figured these forms might disappear and some day the data on them might be useful. Thanks for putting up the links to these New York Times opinions. I hadn’t seen them. ” Wolves do not kill humans” What about Kenton Carnegie in 2005 ? Wolves have killed many Peasants in Russia. Italy, and other European Nations, one of these days the wolf will end that belief right here in Idaho, I don’t doubt it for a second..The New York Times should concern itself with New York and stay out of our back yard in Idaho. The sooner the wolf blows that myth here the better, For us and the wolf. All you need is one inexperienced REI back packer to run from them and it is done.. I have not seen any 200 pound wolves, although I have seen some very large wolves in the Sulpher Creek Drainage..Frank Church, I think the long legs cause some people to over estimate the wolves size, I estimate some I’ve seen up close to be 90-100 pounds, and one Alpha male in this area was obviously larger than his compadre’s, I would guess 20 pounds more, Their feet fascinate me and that lope is cool, I am looking forward to heading in there and watching the show again. I personally believe we are saturated with wolves.. I agree with that. Any time a coyote or anything bigger is even moving through a pasture where livestock has been in the last decade then the predators are surely eating the rancher out of house and home. Greg, I agree that while it is true that there have been people that have been attacked by wolves, the vast majority of them have been rabid or have had their normal food supply wiped out, like in Western Europe. You see this same thing happen with lots of predators, such as the lions of the Tsavo in the 1890s (“The Ghost in the Darkness” movie tells a fictional version of the story) . The Kenton Carnegie attack, while unfortunate, is the first recorded attack in North America. Wolves are not as dangerous as people say they are and I think this proves it. Many more people are attacked by dogs, cats, cattle, bees (and plenty of other creatures), than are by wolves. We are beyond saturated with those but I don’t see anyone trying to kill them off or having meetings and rants. Kenton Carnegie was killed by a bear. Russia is also good for making up tales over wolf attacks, its deep seated in their folklore. Particularly in rural areas, aka where those ‘peasants’ are, where knowledge of wolf behaviour is minimal or non-existent and wolf hunting is carried out with abandon. The country also uses these stories as well as the ‘they destroy our deer populations’ line to justify mass eradication programs, including baiting, outside of the 13 000 animals killed for pelts every year. While I am not saying wolves are harmless to humans, any wild animal can be dangerous, but a great majority of confirmed attacks and the few fatalities could have been avoided because most of the time its someone being stupid. I had to tell three people that very same thing today. When I explained why, they were satisfied that I was probably correct. As Dr. Paul C. Pacquet states, bears “peel” their prey and wolves dig out the organs first. Kenton Carnegie was “peeled” and his organs were still there. Dr. Pacquet, a predator specialist, disputes Val Geist’s conclusions emphatically. Dr. Geist is not a predator specialist but was called into the investigation regardless of his inability to discern evidence and habits of specific animals. Dr. Pacquet showed Carnegie’s ripped open body. There sat his liver completely untouched, but the animal had been eating the muscle. This is typical of a bear. Wolves would go for the liver first. I have not brought this up very often but I do agree with Greg on the point that sooner or later they will be one or more attacks by wolves on humans. Each wolf is an individual and may react to different situations different ways. A wolf will have a mental or physical defect from whatever cause. And (fill in the blank). Having said that it must also be pointed out any of the above situations would be an EXCEPTION to the rule for the reason that the dynamics of a wolf pack results in a very rigid society and thus is highly self regulated and the vast, BUT NOT ALL, individual wolves that are “”different”” tend to be killed by other wolves. Habituated wolves to humans or human provided food, and all bets are off just as with any other animal. I would also like to take a minuet to point out some things that are generally overlooked about the history of Europe as compared to the history of America with regard to a wolf- human dichotomy, and maybe Greg could correct me if I am off base here. In Europe there has been centuries of war for one reason or another. and there are innumerable instances of hundreds, thousands, in some cases more, people killed in a day, days , or maybe a week. As far as I know,more often than not, all those corpses were then left where they fell. Now what do you supposed happened then. Also I would like to point out that the assertion that wolves in Siberia for some reason are much more aggressive to humans than elsewhere. Now consider that the Soviet Gulag system was based primarily in Siberia in which, by conservative estimates, hundreds of thousands of people disappeared. now in the middle of a Siberian winter with the ground frozen solid for yards deep, at 30-40-50 below zero do you think that all those people that died were given a proper burial? Very good points, and not often considered by Americans who don’t care what happens any place else unless it gives them grounds for an argument… however feeble it may be. If it happened anywhere else, regardless of the blatantly different environment and circumstances, it’s fair game (all pun intended). I agree with your point Jeff. I hadn’t mentioned it before, but probably the reason India has had more wolf attacks is due to its one billion people inhabiting an area smaller than the United States coupled with aggressive predator control of livestock killers, what else will wolves hunt? Since we don’t see this scenario in the US along with the ones Jeff mentioned, that is more evidence of us having less to worry about. Here is another wolf behavior i have personally observed. The first wolf that shared my life was a female that had been captured in Alaska as a six month old pup and subsequently shuffled thru several”owners” in Washington and Oregon until I took responsibility for her, pregnant, in Eastern Idaho. This was in the early seventies before the ESA. Now this is the interesting part that I have never seen mentioned elsewhere, so it may just be an aberration but with everything I know about wolves I thing that this may be a distinct behavior trait. When she gave birth I was in the den with her,(yes she dug her own den)and when she was done delivering eight cubs, she carefully cleaned each one, all the while smelling each one stem to Stearn in a very intense focused manner. Out of the eight she singled out two of them and killed them. One had some very obvious physical deformities in one of it’s hind legs and the other had nothing that I I could see at that time as being deficient. She then took each one and, after I got the hell out of the way, took them out of the den and left them out side. I keep looking for some other written account of this behavior to see if it has been observed elsewhere but like I said I have not come across it. That’s interesting. I once had a cat, I know different species but…, After she gave birth to five kittens in a box I provided, she did exactly the same sort of thing. I sat up with her during the birthing and when she had cleaned and smelled each of the kittens, she killed and pushed to the opening of the box, the bodies of the two. The rest were healthy and grew to be beautiful cats. Animals, regardless of some domestication, will revert to natural instinctive behavior when it comes to their reproduction and nurturing practices, at least that’s what I have always observed. I don’t think it was all that unusual. Humans have lost their ability to determine identity and other physical conditions of their cohorts, most other species are still able to do these things. The signifigant difference between humans and other species is our usage of technology. We thrive on artificial life support, pills this, surgery that. I am not saying don’t use it, just recognize that our afrtificial existence is by our choosing. The animals exist by necessity….and therefore so do their instincts. They survive by culling themselves, and other species. They don’t have the advances we do, that help determine flaws within animals. The flip side is, with all our technology we still cannot out do wolves when it comes to detecting deseased animals before symptoms are in over drive….such as CWD. I wonder, sometimes, whether all the scientific/technological “advances” humans have devised are really advances or a component in our eventual demise as a specie. Unfortunately, we are likely to destroy all the other species, flora and fauna, before we die out. I have been in the “dog” business my whole life. Every dog I have ever raised that has whelped pups does this. The sniff is a dog’s best way to do a vet check on their pups…tehir nose is their biggest asset in most cases. They don’t kill one every time. But I have seen them time and time again push one pup off to the side and it won’t eat, or isn’t allowed to. Within hours it is dead. Often the pup is like your wolf’s deformed pup…in respitory distress or having obvious malformity. To my knowledge, wolves and many other predators do this as well. To some degree they will even kill or seperate out offspring when they have limited resources to feed them. A classic example: The Panda Bear(though herbivores). They will often give birth to two cubs. When it occurs, they seperate one out. Their habitat only allows for them to nurture one young. So they are scientifically thought to choose the larger or stronger baby. Thus insuring that atleast one of their young has a good chance at surviving. When we ask why nature doesn’t just eliminate multiple pregancies in such animals, we should consider the theory fertility docs use for implanting more than one human embryo…it increases the liklihood that atleast one will make it. After birth, that is left up to the mother. This is true of dogs with pups that are exposed to illness. When a female has a pup that has a desease, she will often carry it far from her den or whelping area. I have seen greyhounds do this with pups that have been tested positive for parvo or canine influenza. Humans lack in this area. Our compassion sets us higher, and lower, on the evolutionary table here. We have, in theory, through our own compassion enabled our weaknesses to be bred further into our gene pool. Some would say that had we not lost our ability to cull our own, we would have culled out sickle cell anemia, hemophillia, and Down’s syndrome etc. Others would argue that we have evolved from such barbaric and savage tactics…that this behavior lead to Hitler and the like, and in that arguement we can clearly see how this is considered an evolved behavior, and not a set back (Thank goodness we saw through some of his madness). Me, I just choose to believe that we have exceeded mother nature’s plans for a population control. There is rarely anything natural about humans anymore. I think we are the most volatile of breeds. We have the means, the ability and some have the desire to artificially control every aspect of life…..geez, and we worry about republicans tapping our phones. My aren’t we focussing on the small picture. Truer words I have not heard. We are our own worst enemy. I have heard of more than one wolf attack on a human. One lady on TV was attacked and she and her kids swam into the ocean to escape the wolf. It was in Canada I believe. Still, statistically you’d be more likely to die from a big bite in your own home. Compassion, humility & restraint aren’t so loud as are unfettered ambition, wrecklessness, and other destructive human characteristics – but they are as much a part of our nature as anything – it seems to me we just have to be as willing to insist upon them as others are willing to insist on the others. I have learned to get up into a high basin for the nights while in the back country wilderness, then I am not down in the low parts of drainage’s where the hunting is happening..so far zero contact, But camping lower they walk right in..take a quick look around and off they go, so fast I don’t even have time to stand up..I believe Val Giest myself, as long as they have a prey base we are cool…You guy’s are right statistically the human threat is no more than a Bear or Couger.. I think we should forget about hunting them, and go forward with capture and removal to other states wanting wolves. Then your wolf is not being killed and your opponents feel an effort is being made to support their wish as well…Like I said many times, if your not going to eat it, don’t kill it..I have no intention on eating wolf. And I believe hunting them in this vertical landscape would be a joke..unlike Wyoming’s bad lands where I know I could run them down with my horse..
I’m just relieved that the wolverine is holding their own..Gosh Google wolves versus wolverines for a hoot, and watch the wolverine whoop arse on the wolf…to funny.. The point and problem with the discussion about potential wolf attacks is it incites so much emotion to hate wolves and everyone that may be in support of their place in the ecosystem (including hunters and ranchers!). Furthermore, it thwarts common sense. I.E. People succumb every day to the notion that they will win the lottery. Probability says otherwise. If ppl are truly concerned about wolves attacking humans or killing all the elk why aren’t they as concerned or more concerned about things which are more probable? I.E. How come the same ppl who hate wolves bc they eat elk aren’t putting any energy into minimizing deer/elk collisions on the road? – which is and has been a bigger threat to big game populations. The probability does increase as wolves increase in number and management is at a stale mate. I am not saying everyone falls under this category but most of my friends/associates that are anti-wolf buy into “little red riding hood” fear mongering and it becomes the underlying doctrine fueling their dislike of wolves in the west which makes them look like the guy who is counting on winning the lottery to solve all their financial problems. When I checked out the links jdubya posted to the NYT, I spotted this one as well. Some interesting ideas on reducing environmental damage. I´d like to remind you on the study of Linnell et.al., titled “The fear of wolves: a review of wolf attacks on humans” (2002) that provides also an analysis of the attacks in India and the different Areas of Russia. It´s available on http://www.lcie.org/ thus difficult to locate on their site and you cannot link direct to the page. Go to the Publications section on the menu on the left, select Species, on the Species page select “wolf” and scroll down to the document. I have linked to it many times in the past, generally after someone breathlessly comments that there have been wolf attacks. The answer is, of course there have been, and this document gives many details about the attacks. Greg I don’t mean to factisious about this, hell I do not even know if Russian wolves ARE more aggressive to humans, but if I take that assertion at face value and then ask why? what in the wolf’s experience would have brought about that behavior and also knowing that wolves pass on that “knowledge” to successive generations what are we left with? Why in Russia and to a lesser extent Europe and virtually no where else and realizing that we are talking about a species second only to humans in global distribution. (historical). Kenton Carnegie was in fact killed as a result of being attacked by habituated wolves. I had access to all pertinent material and I suggest to you that Paul Paquet concocted his bear theory to protect the wolves he idolizes. There was no evidence of a bear in the area and none of Kenton’s injuries were consistent with a bear attack. It is time to accept that wolves can and do kill humans. Lori….Paquet’s quote..” I conclude that the cause of Carnegie’s death remains unknown and that the judicial inquiry erred in its determination”. Will you cite evidence confirming that wolves killed Carnegie? Jerry b … the quote you have stated indicates that Paquet is now saying that the cause is unknown even though he spent a great deal of energy trying to convince people that a bear was involved. I guess the quote speaks for itself in that he is attempting to redeem his reputation after making such a ridiculous claim initially. Unfortunately Paul Paquet was biased in his opinion and presented a report that distorted facts in order to protect the conservation of the reintroduction programs he supports. My opinion is based on all available evidence, expertise of several biologists and being present at the inquest. The outcome of the inquest states that Kenton died as a result of being attacked by wolves. The only person present at the inquest that did not agree with the jury’s decision was Paquet. In fact he wasted no time in challenging the process and making sure the press expressed his point of view. Since Paquet showed a photo of Carnegie’s ripped open abdomen, how do you account for his liver being untouched even though a fair amount of muscle was eaten? Wolves love livers. I would be interested in knowing who Paquet shared those photos with since this evidence was part of disclosure. He obviously did not abide with the privacy act in Canada and once again I find his actions disturbing. He was less than professional in the coveted role he was assigned by the coroner. People are missing the point that a human life has been lost. This was a horrific death with considerable suffering and pro-wolfers are more concerned with defending these predators than accepting their ability to kill. This whole debate about what a pack of wolves would or would not consume is unprecendented due to the lack of documented cases. You also must consider the number of animals involved at one time and their unusual prey. What you should be considering is that is was evident that wolves were present at the scene, but there was no evidence of a bear whatsoever. Paquet does not deny the existence of wolves at the scene, but he was unsuccessful at convincing anyone of the presence of a bear. He used a moose expert to testify by phone for the inquest and unfortunately this witness was not at all credible given his relationship with Paquet, his level of expertise and his poor testimony. Lori….you seem to have an “intense” interest in this case. Care to let us know why? Unfortunately, we’re hearing only your side and we know nothing about your credibility. What is your expertise? I do not have any “expertise” in this area, but was able to make an informed decision based on all the evidence, discussions with all people involved in the investigation as well as consulting with other experts in the field. I don’t have any particular interest in defending wolves in this matter. The Carnegie case is interesting, however. Wolves have been harmless to humans here in the lower 48 states, without a single attack or even wolf bite from wild wolves (by that I mean by wolves that are free to wander and don’t live in enclosures). Meanwhile, almost every large or medium sized animal has killed at least one person. Paquet told the audience there were certain photos that could not be legally shown, but the ones he did, he said were OK. The fact is that ANY animal can kill a human. Do an internet search and you can find cases where deer have killed people. Elk and moose have, and domestic dogs have killed more people than any of these. The single biggest killer of all is the mosquito. Regarding predation, bears certainly have killed and eaten human beings, but it’s rare. Even when a mauling occurs, it is normally a “get out of my face, territory, away from my food, kids” kind of warning, even though the bear could easily kill and eat the interloping human. The general statement that bears are not predators of humans remains true, even though there are exceptions. Of course there are instances down through history where wolves have killed and eaten humans. In India, for example, where they do not bury their dead. Leaving human remains lying about is the same as leaving cattle carcasses in a pasture. You are going to bring predators in, who are going to learn that this is a source of food. None of this changes the fact that wolves normally are not a danger to humans. What if Carnegie was killed by wolves? So what? I don’t mean to diminish his life, but rather my point is: Would we even be having this conversation if he had been kicked to death by an angry bull elk, ripped to shreds by a pack of domestic dogs, stung to death by a swarm of bees; or even, for sure, been killed by a bear? The difference in the Carnegie case is that we are dealing with habituated wolves. However, there have also been other wolf attacks which have resulted in injuries; one in Saskatchewan less than a year before Kenton’s attack in addition to numerous attacks in Ontario and Alaska. So not exactly harmless to humans north of the border. On a separate note, I find it interesting that Paquet indicated that it was legal to show some of the photos, but used discretion for others. My understanding is that the photographs were taken by the RCMP and were part of the evidence and subsequent disclosure for the inquest. Not sure how showing a photograph of the victim was at all acceptable beyond the investigation. That just shows extremely poor judgement on Paquet’s part. Hopefully your response was not in reference to anything I have posted. I agree that the Carnegie case was a rare incident and I have no opinion as to what should be done with regard to wildlife management of wolves. I was writing to respond to John d’s comment on April 13 about a bear being responsible for Kenton’s death. I disagree with his comment and felt it was important to share my point of view. The animal in question should not be an issue, but I think people should be realistic in accepting the events in this case. The reason it became such a controversy was because of the rarity of this attack and the fact that wolves tend to arrouse such a passion in some people. you may be successful at dispelling any hatred for wolves in your multiple, backtracking comments following your initial retort but it certainly sounds like you have some deep seated hatred for Dr. Pacquet… interesting. Hmmmm? I sure sounds like you just have it in for Dr. P.
I never indicated a hatred for wolves, just a concern that people still believe that Kenton may have been killed by a bear rather than the animals actually responsible for his death. Curious as to your association with Paquet that you were also privy to the photographs. It sure sounds like they got around and utitilized beyond the investigation. I believe I am justified in my feelings towards Paquet based on my personal experiences, just as you obviously have your opinions. A number of us who regularly comment here were at the meeting where Paul Pacquet presented (for almost 2 hours, if memory serves) the information about this case. If memory serves, he suggested that the cause of death was not determinable. He noted that wolves were clearly present, but also that the wounds and positioning of the body (i.e. straight line dragging), were what one would expect of a bear. I did not leave the presentation thinking that Pacquet demonstrated that wolves did not kill that poor young man, only that there was considerable room for doubt as to what species was responsible for his death. Personally, I don’t feel I have a stake in the matter. We know that wolves have killed people in the past, and it was (or is, depending upon your point of view on this matter) only a matter of time until they kill someone again. The fact that some wolves under some conditions kill people does not separate them from any other large carnivore. In fact, it doesn’t separate them from most large animals. Keep in mind that man’s “best friend” (and the wolf’s closest relative) kills ~25-30 people every year in the U.S. alone. Frankly, I still think the most amazing thing about this case is how controversial it has been. I believe the problem with Kenton’s death being attributed to wolves that were healthy, albeit some what habituated to humans, is that it exposes the lies that wolf advocates have told and continue to espouse. In fact, wolves can become lethal to humans. While it may be rare, it can and will happen. It has gotten so rediculous that they are now posting on this blog stories of cattle killing humans. If everything else has killed humans, why do so many wolf advocates continue to insist that wolves will not? Throughout the introduction process of wolves, wolf advocates stressed that only diseased, malnourished, or immature dispersing wolves had came into conflict with humans. The Carnegie case clearly exposes that healthy wolves can, will, and do kill humans. Wolves will kill people, but it’s very rare in North America. These stories are posted to put things into perspective for those who get their information about wolves from anti-wolf groups and/or cultural tradition. No matter what anyone does in this life, we are all going to die from something and it is rarely up to us as to how and when regardless of any level of caution. This argument is so petty in perspective to the importance of the real purpose of reintroduction. Good point! However, there never would have been any argument in any of this had people just accepted that a young man lost his life as a result of being attacked by wolves. The controversy exists because it was “wolves” and there appears to be strong division in point of view regarding this animal. The debate only exists in the US where reintroduction is a concern. It does not seem unreasonable to be responsible in managing wildlife in environments where people live and work as was the situation for this Carnegie case. There were issues that deserved consideration which have nothing to do with reintroduction, but with animals living in the same space as people just doing their job. The incident where Fred Desjarlais was attacked by a wolf less than a year before Kenton should have been a wake up call to the Ministry of Environment in Saskatchewan. There were issues with remote working conditions, habituated wildlife and open landfill sites which attracted wildlife. There was an opportunity to take Fred’s attack seriously and make some changes which may have prevented the fatality that followed eleven months later. My issue has never been with the animal responsible, but the controversy that transpired because wolf advocates fought back to deny that wolves could have been responsible for Kenton’s death. It also concerns me that their messages could also result in people not giving this animal the respect they deserve should they have an encounter themselves. Bob, I don’t recall ever reading where wildlife advocates (and I think most who comment on this blog are “wildlife advocates” not just “wolf advocates”) have claimed that wolves never have, never would, never could kill people (especially when the wolves are habituated); only that it is very rare. Why should that be any more of a story than the cows killing this lady? Or any other animal killing someone? Deer, snakes, bees, dogs, you name it! I think we all know that animals sometimes kill people. Mosquitoes kill 2 million people a year, snakes 100,000, scorpions 5,000, elephants 600, hippopotamus over 200. Yet dispite the thousands of wolves in Alaska and Canada (and thousands that used to be in the lower forty eight, and hundreds there now), you have to search the internet to find a handful of people killed by wolves in North American history. Why? Because it is so rare. You are hundreds of times more likely to be killed by your nieghbor’s dog than by a wolf or bear. Over 3 million people visit Yellowstone every year. A land, one could argue, that is filled with habituated wildlife. Yet not one person has been attacked by a wolf (yet), and bear maulings are extremely rare (average one per year). Could the attack on the photographer in 2007 in Hayden Valley be judged to be a precurser of another attack a year later? As it happened, there were no attacks in 2008. Wildlife doesn’t habituate itself. People habituate it. A homeowner puts food out for the deer. The large number of deer in the area bring in a mountain lion. The mountain lion kills the homeowner’s dog. Is that the mountain lion’s fault, the Forest Service’s fault or the homeowner’s fault for feeding the deer? Should the earlier incident been a “wakeup call” for the Ministry of Environment in Saskatchewan, or for the other workers in the area? I still believe that there was an opportunity for consideration since the Ministry of the Environment is responsible for the management of wildlife and landfill sites. They could have made changes to the open landfill at Points North since it was attracting wildlife. There was also an opportunity to educate workers on the dangers of habituated wildlife or deal with the wildlife directly with aversive conditioning or relocation. Safety should always be a priority when the potential for wildlife encounters exists especially in a workplace setting. Lori I have to jump in here. . . we are each responsible for ourselves. It never helps to try and get a government or an agency to educate, mitigate or protect us from the natural environment even if that environment kills us. It is sad when someone you know dies and you think it could have been prevented by someone else who didn’t do their job but the bottom line is, and has to be, that we each look out for ourselves or else the world will be a place that is is sanitized, so safe, so boring and so terrible to live in that we all might as well be dead and be done with it. It doesn’t matter whether the animals are habituated or not, we need to be aware all of us and each of us that any day any time and any where any animal can kill us. . even a bug. You can be sitting in your house safe on your computer and a plane can fall out of the sky. . .
And, as a tracker it very often happens that I come upon a dead animal and another one lurking close by or actively feeding on it. With a little scrutiny, however, I find there is a big difference in what killed something and what eats it. Very often the eater is not the killer. If animals had lawyers there soon would be in place a crime scene protocol for animal caused deaths and then we would probably see a different picture. In this case, it could have been that wolves killed the man, then the bear took him away from the wolves . . or something else killed the man, the wolves found it and the bear ate it. The bottom line is we often don’t know what happened for sure and we assume things and unless someone is left to tell the story, and sometimes not even then, we will never know. You seem personally involved in this incident and I hope for your sake that you gain closure someday. I think the bottom line is, no wild animal can be trusted completely. The only bear that I’ve ever had to shoot was in full charge. While pheasant hunting one afternoon I had a badger chase me about 50 yards down the fence line away from her den. Just a couple of weeks ago we were visiting relation in western Montana and they have a whitetail doe that will not let them in their own back yard. Juat today while installing new windows in a home we’re working on we have a couple of birds dive bombing us as we are installing windows on the second floor, even to the point of hitting you in the back. Wild animals are wild and habituated animals can be even worse. There s no always or nevers. they do what they do and all we can do is try to be ready for it if and when it might happen. When I was ~10 I climbed a tree so I could look in a robin nest; no ill intent on my part at all. Well momma robin turned me every which way but loose to the point that I fell out of that tree at about 12 feet. I could have very well died from that fall. Just wasn’t my time I suppose. I would agree with that, except I would eliminate the “wild”. Search for attacks by cows, horses, domestic goats, whatever, in addition to dogs, and you will find plenty. People just freak out when a large predator is involved because we have “Little Red Riding Hood” (and similar stories) ingrained on our psyche as children. Even though deer, moose, bison, cows, horses etc., etc. are responsible for far more attacks on people than wolves or bears, and insects are the real killers in the animal kingdom. …”And the mosquito huffed and puffed and blew the house in….” just doesn’t work! In any case you are far safer walking through the woods than through the streets of LA or NY. In general, animals just can’t be reasoned with most of the time. You have to let any animal have its space and if it is wild it is even more relevant. I’ll take my chances in the woods any day. I’ve always felt way more comfortable in the woods than I ever have in any city. I spent a couple months in New York City wrking one summer and I don’t think I felt at ease the whole time I was there. I’ll take the woods and critters anyday. Being only slightly facetious here, I remind all of that infamous anecdote where President Jimmy Carter was attacked by a rabbit ( an herbivore). Wolf attacks on humans are rarer than Elvis sightings. I’ve never known a wild wolf to come towards a human in anger or with harmful intent. They always turn tail, or adopt a defensive stance. But attack ? Uh , no. If so we would have reams of anecdotes from B.C. and west Alberta and the Yukon and Alaska , wouldn’t we? The Eastern Europe tales and Medieval lore have little if any bearing on our Northern Rockies Wolf situation. Do keep an eye on your neighbor’s Pit Bull or German Shephard, however. A Wolf on Man incident will probably happen sooner or later, but the circumstances will be unique …< 1 percentile… and will add little substance to the debate one way or the other except to inflame it. Dewey, you have a good point there. even in places like Eastern Europe or India where wolf attacks have been (rarely) reported, I would rather take my chances with them then I would with somebody’s German shepherd of pitbull. An owner who is stupid with those dogs has a much more dangerous animal than any wolf could ever be. I couldn’t find anywhere else to go, but are wolves bigger than wolverines or is it the other way around or are they equaly matched? Wolverines have been said to drive a grizz of a kill. If I had to pick, I would rather face a wolf than a wolverine any day of the week, wolverines are down right nasty sometimes! I am amased that some people still believe Kenton Carnegie was killed by a magical flying bear. Paul Paquet never saw the kill site only, photgraphs. 3 other expert wolf biologists also saw the same photos. The investigating police officer, coroner, and 3 other co-workers saw the kill site, the tracks, the disturances in the snow, AND THE WOLVES. They all agree that they saw only wolf tracks and NO BEAR TRACKS OR BEARS.